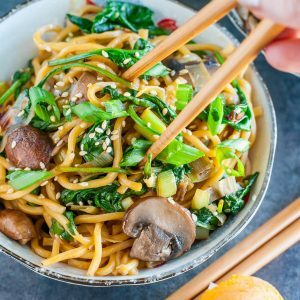 These take-out inspired Spinach, Mushroom, and Leek Noodle Bowls are tossed in the most amazing homemade sesame sauce. Pair with your favorite protein, or enjoy all on it's own as a tasty vegan/vegetarian main or side! 8 ounces fresh long life noodles* or use your favorite noodles! Place sesame seeds in a large pan over medium heat and toast, stirring, until golden brown (3-5 min) Transfer to a medium bowl. Add soy sauce, rice wine vinegar, sesame oil, honey, as much crushed red pepper as desired, as well as half of your of scallions, and 1 tablespoon water. Stir to combine. Rinse leek and trim and discard dark green tops. Halve lengthwise, then cut crosswise into 1- inch pieces. Wash to remove any interior dirt and set aside. If you haven't already, clean and slice your mushrooms and scallions as well. Add 1 tablespoon oil to your pan at medium heat. When oil is shimmering, add mushrooms, leeks, and most of your remaining scallions (save a spoonful or two as a garnish) and sauté until tender and softened. Taste and add salt and black pepper as desired. Remove pan from heat and set aside. Next season a pot of boiling water generously with salt and cook your noodles per package instructions. I was using fresh, refrigerated noodles so mine only took 2 minutes so. Dried noodles will typically take a bit longer but nothing extreme. Add noodles to the pan with your veggies and heat to medium-high heat. Push noodles and vegetables to outer edges of pan and add sauce to center of pan and simmer until thickened, about 1 minute. Stir to combine, then add spinach and cook until just wilted, about one additional minute. Taste and add salt and black pepper as desired. Garnish with extra sesame seeds (optional) and the remaining green onion. Enjoy! * You can use anything from ramen noodles to lo mein style noodles for this recipe. If using dried pasta instead of fresh, simply cook in the pot first, per package instructions, then set aside to add to your stir fry. This tasty dish can be served as a meal for 2 with your favorite protein (or all on it's own!) or double as a delicious side dish for 4. The leftovers are also fantastic the next day; we stir fried our leftover noodles with shrimp and green beans for lunch and loved it! On it's own the dish is perfect for vegans, vegetarians, and t-rex chefs alike! Feel free to add your favorite protein such as shrimp, tofu, chicken, or beef to round out the meal.